When I was at school I was many things. An actor, a musician, a dancer, a writer. I participated in plays and concerts, choreographed dance routines and even wrote a string quartet as part of my A level Music course. Every lunchtime and evening after school would be spent at some form of practice. Creativity was part of my everyday life. Now I’m a mum. Just a mum. Or at least that’s how I felt for a long time. My boys are 7 and 3 and I spent a lot of time during those first precious years as a parent commuting up and down the M6. Working days could be anything up to 12 hours long and I felt stuck between work and family life – unable to fully commit myself to either. Creativity had been slowly disappearing after leaving school, University life offering far more exciting things than band practice! But now it had gone completely. No longer a priority in the busy life of a working mum. A change of job brought different pressures and a different motorway to negotiate but the underlying problem still existed. I was a terrible mother. I was useless. I couldn’t cope. Fast forward a few years and I was diagnosed with an anxiety disorder. It took a long time for me to admit that there was something wrong. I was convinced I was simply a bad person; lazy, pathetic, emotional, needy. Despite having given up work to look after the kids I still felt inadequate compared to all the super-mums around me. A combination of counselling, CBT and medication has finally put me on the right track and I’ve started to rediscover my creative side. I didn’t start 2016 with a burning desire to change my life, instead it was more a matter of opportunity and timing. My youngest was starting nursery and I suddenly had a full 2-3 hours a day to play with! So on 6th January I published my first blog post, ‘To blog or not to blog?’ It received a massive 22 hits but it opened up the possibility of something I wouldn’t have even considered just a few months earlier. After the initial fear factor and constant inner monologue (‘What an Earth am I doing?’ ‘What will people think?’ ‘Don’t be stupid.’ ‘You can’t be a writer?’, etc. etc.) I actually started to enjoy myself. A few people came up to me and said they enjoyed reading my blog and that they wished they could write. Rather than being ‘just a mum’ I was now a mum who also did a little bit of writing on the side! Since then I’ve written a number of short stories, had an article published on an online parenting site, entered writing competitions and made a very tentative start on a first novel. I’d love to win a prize and be published (let’s face it, who doesn’t need an ego boost every now and then?) but more importantly, I’m doing something I love. Something for me and no-one else. I’m still a mum and I always will be, but I’ve now allowed myself the space to be so much more. I write in those precious few hours in the morning when the kids are at school and nursery. I spend far too much time on Twitter but have been able to link up with writers (both published and budding amateurs like myself), bloggers and publishers all over the world. In fact, I’m writing this post due to a chance Twitter connection with the lovely Lucy! I’ve learnt that there’s no such thing as ‘just a mum’. Instead it’s a label we often attach to ourselves to justify not having a ‘real’ job. Parents, whether working or not, are project managers, constantly dividing their time between conflicting priorities and we owe it to ourselves to gives ourselves a break every now and then. I’ve finally accepted that allowing myself ‘me time’ in order to be creative is as important as getting the kids to school on time. It keep me healthy and helps maintain my sanity in some of those more challenging parenting moments! For some people it will be taking an art class, going for a run or baking a cake. Whatever your passion I encourage you to grab it with both hands and stop feeling guilty about spending time on yourself. I’ve finally re-discovered what had come to me so naturally when I was at school, and it only took 20 or so years to do it! You can find Michelle at www.alittlehelpwouldbenice.blogspot.co.uk and on Twitter @TheTrueMC. Do go and link up…and is it just me that thinks 22 views for a first blog post is pretty good? Take a digit off that number for mine! If you enjoy this series, please do check out the Creative Mothers page and contact me to be involved – I’d love to hear from you. And if you enjoy my blog and want to know why Brilliance in Blogging ‘vote for me’ badges pop up on it in places you might like to read this post. Another great post. It’s lovely to hear when someone has been able to find time for themselves to do something creative that they enjoy. Isn’t it!? I think placing value on creativity and time for yourself is really important. Yes, well my two views were probably me and my husband! I am so glad you’ve been able to channel your creativity again; it sounds like it’s a huge part of who you are and something you are passionate about. You sound like you are creating lots! I totally agree that you need to do these things to make sure you feel like more than ‘just a mum’. I think it actually makes you a better mother and partner when you have made time for yourself or to follow your passions. I’ve finally accepted that allowing myself ‘me time’ in order to be creative is as important as getting the kids to school on time. Thanks for all your lovely comments and apologies for the delay in replying (I’ve only just figured out how to – creativity does not necessarily equal technological know how!) Thanks to Lucy for the opportunity to contribute to such a fantastic series. 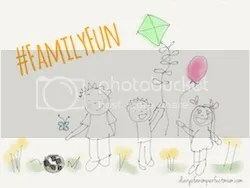 Thank you for linking this with #familyfun I loved hearing about Michelle and am now going to check out her site.